As discussed in earlier section of a.c. distribution system we have take into account the power factor. This power factor can be either considered with respect to receiving end voltage or with respect to load voltage itself. Let us consider each case separately. Consider an A.C. distribution PQ having concentrated loads of I1 and I2 tapped off at point Q and R respectively. This is shown in the Fig. 1. 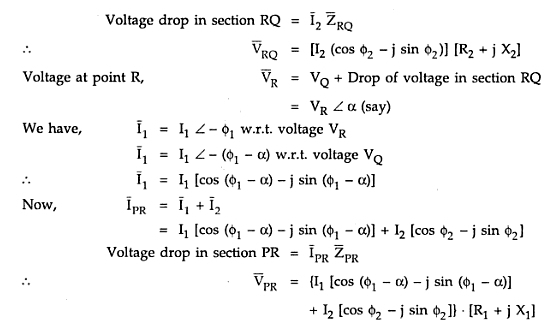 Let voltage VQ which is the voltage at the receiving end be taken as reference vector. The power factors at R and Q are cosΦ1 and cosΦ2 with respect to VQ and they are lagging. The corresponding phasor diagram is shown in the Fig. 2. As shown in the Fig. 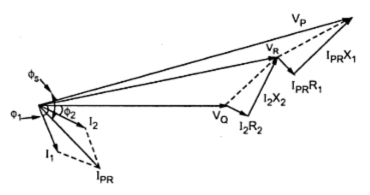 2. the receiving end voltage VQ is taken as reference vector. The currents I1 and I2 are lagging from VQ by angles of Φ1 and Φ2 respectively. The vector sum of I1 and I2 gives current IPR. The drop is I2R2 in phase with I2 while I2X2 is leading by 90o. The vector sum of VQ, I2R2 and I2X2 gives VR. The drop IPRR1 is in phase with current IPR while IPRX1 is leading by 90. The vector sum of VR, IPRR1 and IPRX1 gives the sending end voltage. In previous section we have considered the load power factors with respect to receiving end voltage. Here we will consider these power factors with respect to their respective load voltages. 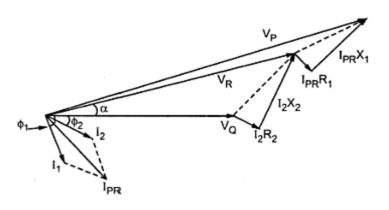 Now Φ1 is the phase angle between VR and I1 while the angle Φ2 is the phase angle between VQ and I2. The phasor diagram under this condition will be as shown in the Fig. 3. Here again the receiving end voltage VQ is the reference phasor. The vector sum of I1 and I2 gives the current IPR. The drop I2R2 is in phase with I2 while I2X2 is leading by 90. The vector sum of VQ, I2R2 and I2X2 gives voltage VR. The drop IPRR1 is in phase with current IPR while the drop IPRX1 is leading by 90o. The vector sum of VR, IPRR1 and IPRX1 gives the sending end voltage Vp. Thank you very much..it is really useful..